Henry Ford Hospital President and CEO Dr. John Popovich, Jr. interviews Clinical Nurse Specialists Cathy Jackman and Jean Talley about their roles in the Henry Ford Hospital Magnet Recognition Program journey. Henry Ford Hospital (HFH) President and CEO Dr. John Popovich, Jr. interviews Gwen Gnam and Madelyn Torakis in the next edition of “Interviews in front of the Living Wall: Legends Interviews.” In this segment, HFH Chief Nursing Officer Gwen Gnam and Clinical Nurse Specialist Madelyn Torakis share details of the hospital’s Magnet® Recognition Program designation journey for the Department of Nursing. Magnet® designation is the most prestigious distinction a hospital can achieve for nursing excellence, innovations in professional practice, and quality patient care. For the 2012 Henry Ford Hospital Grand Ball, we wanted to make a high-impact video that expresses the passion that we have for our great hospital’s past and its future. Enter our creative partners from DBA. They donated their time and talent to create a video modeled after the popular TED talk format to serve as that vehicle. I hope the above video from the 2012 Grand Ball inspires, motivates and excites you about the future of health care at Henry Ford Hospital. Change is coming, we are ready, we are Henry Ford Hospital. I would normally be concerned about privacy issues and other regulations regarding the sharing of clinical information about patients, but I am going to risk it to tell you about two recent and unique patients we examined at Henry Ford: Mr. Stradivarius and Mr. Guarneri. Actually these were not really patients but two extraordinary musical instruments: the 1709 Stradivarius and the 1744 Guarneri del Gesu. These very rare violins – part of the historical artifact collection at The Henry Ford in Dearborn – weren’t here for the usual examination and blood work that we would recommend for 300-year-old patients. They weren’t here for a tune-up either. The Henry Ford, the museum and more which is one of the great treasures in the world, was hoping to make new discoveries about these “old world” musical instruments using some of our “high-tech” medical instruments, specifically the computed tomography equipment in the Department of Radiology. So how do you use modern-day medical technology designed for humans to uncover the history of a 300-year-old violin’s design and repair? Enter Henry Ford Hospital radiologist Dr. John Bonnett. It only took one week to prove a point that I regularly tell people: Henry Ford Hospital is so more than just a hospital, a place to care for patients. Many of my regular blog readers have already gotten a glimpse at some of the amazing things that have happened recently at Henry Ford Hospital. 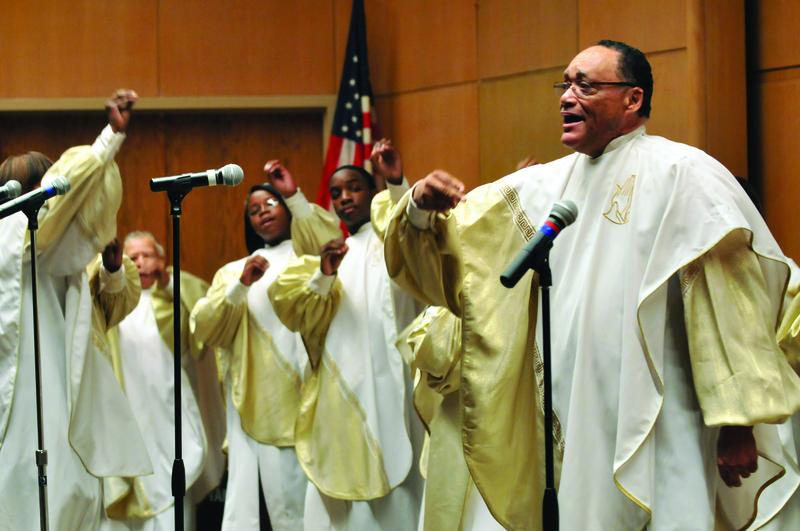 It all started with a community event to celebrate Dr. Martin Luther King, Jr. Day, which showcased some of the amazing choral talent in our city (and in our hospital), as well as a keynote address by Bankole Thompson, the senior editor of the Michigan Chronicle. 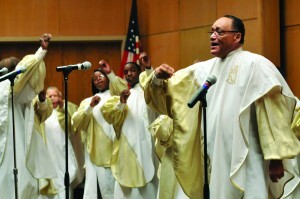 If you have not heard Mr. Thompson speak, you have missed the brilliance of passionate commitment and challenge. Sam Logan, rest in peace; your charge will continue. And the choirs from the Mosaic Singers, Detroit Rescue Mission, God’s Hands of Praise, and our own Martina Gifford and the Henry Ford Health System Choir stirred the blood as much as the soul. Each year, this event is better than the last, and serves as an important reminder of how Dr. King’s visions and principles continue to drive and inspire us in the work we do every day. 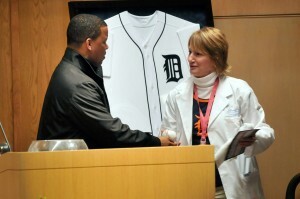 Only a few days later, our employees welcomed the Detroit Tigers 2012 Winter Caravan to our hospital. With Miguel Cabrara, Brennen Boesche and several other Tigers stars in attendance, we were reminded why baseball is such an important part of the growing excitement surrounding our city. Ramon Santiago with Marla Hull, Inpatient Case Management. Baseball is one of the constancies in American life (all respect to James Earl Jones and Field of Dreams). Those of us around in 1968 know the way baseball and the Detroit Tigers calmed and soothed a battered city. Dr. King’s vision was seen in the stands of every home game, and showed us that how even in the most polarizing situation most of us are alike with common goals, aspirations, and dreams. When I last met up with Frank Venegas, we were at the Detroit Institute of Arts talking about Frida Kahlo and her ties to Frank’s family, as well as Henry Ford Hospital. Henry Ford Hospital also has something else in common with Frank and his company, Ideal Group: a focus on innovation in Detroit. One of Ideal Group’s customers, General Motors, is responsible for creating one of the bigger innovations to recently come out of Detroit – the Chevy Volt, a plug-in, range-extended electric vehicle with an on-board gasoline generator. Frank’s even been handing the key fob (no keys needed for the Volt) to business colleagues in Detroit, giving them the chance to test-drive this game-changing product. I thought that one of the best ways to really test the car’s electric charge and gas mileage – and continue the conversation about innovation – was to drive to a few Henry Ford sites in and around Detroit, where innovation is changing how we care for our patients. When you type “innovation in Detroit” into a Google search, the results are a rather interesting mix of links about our city’s history (mostly related to automotive) and articles both doubting and touting the future potential of innovation creating new businesses, products and jobs in Detroit. One link in particular that stood out was an article published a few years ago in the Huffington Post. The headline: Detroit – Innovation City? And it’s a fair question. With all that Detroit has weathered, can a few scattered ideas change its image, create a hub for talent and develop a solid strategy for revival? Today, we have an answer to that question: The Innovation Institute at Henry Ford, which officially opens today (Oct. 10) on the Henry Ford Hospital campus. The Innovation Institute is an important step forward in creating an environment to foster new ideas in medicine, as well as find creative solutions to identify best processes in patient care. But we aren’t taking the traditional route to innovation.